This month my favorite beads are all about great color and fun shapes. 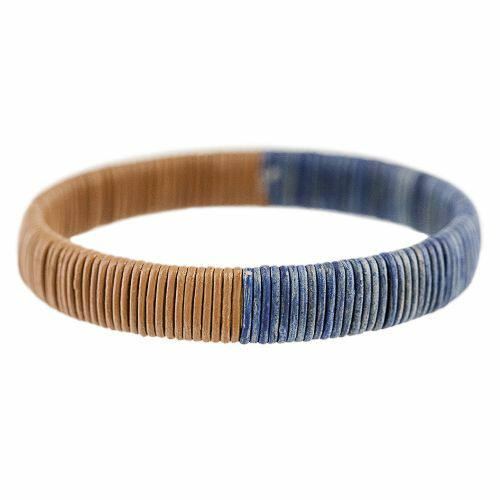 Throughout the year the inspiration of any bead collection can wax and wane – beads that seem exciting one minute leave us stumped the next. Right now, I’ve got my sights on a few essentials that are sure to bring good inspiration. First up is a strand of amazing orange glass beads from Blueberry Cove Beads’ Autumn collection. The best word to describe the color is “Pow!” Its earthiness and intensity is strengthened by the organic finish. It’s not quite Picasso but it has the same “just brushed off the dust” kind of look. I can’t wait to add it to some fringe or a pretty chain. I had all kinds of plans for assorted accent beads in my stash this year, and many of them just didn’t come to fruition. One thing I definitely want to get some use out of before winter ends is this tube of topaz O-beads. They’re great for stitching onto flat beadwork, and to use as delicate spacers. I’m hoping that I’ll find a few more interesting ways to make them shine, too. Finally, I still haven’t broken into any of my strands of vintage millefiori beads yet. I most certainly need to get on that, and soon! There’s something so essentially beady about millefiori, and not just because they’re so classic. The patterns really showcase the wonder of glass art, and that makes them totally perfect for art jewelry. What kinds of projects do you have planned for fall and winter? Everyone loves surprises, and there’s nothing better than an exciting package of new beading materials to help jump start creativity. With stay-indoors weather fast approaching, what better time is there to experiment with new beads? 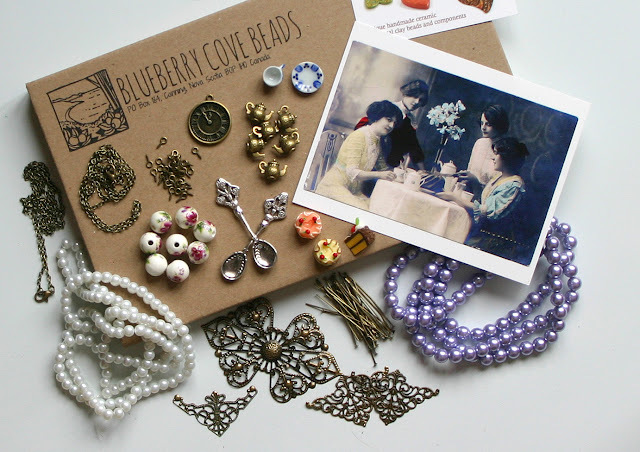 To help you get a head start on your winter projects, Blueberry Cove Beads is offering next month’s bead surprise package to one Inspirational Beading reader! 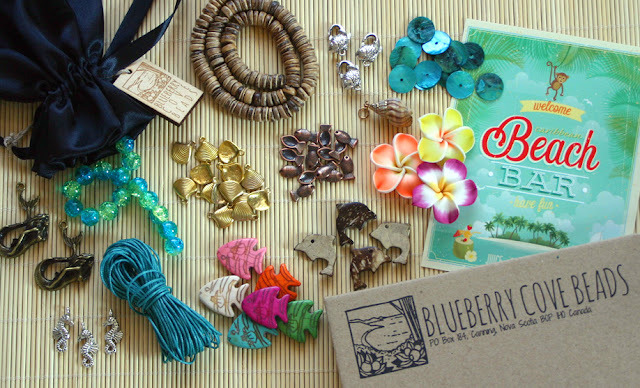 Each monthly bead box contains enough supplies to create a variety of themed projects with coordinated palettes. 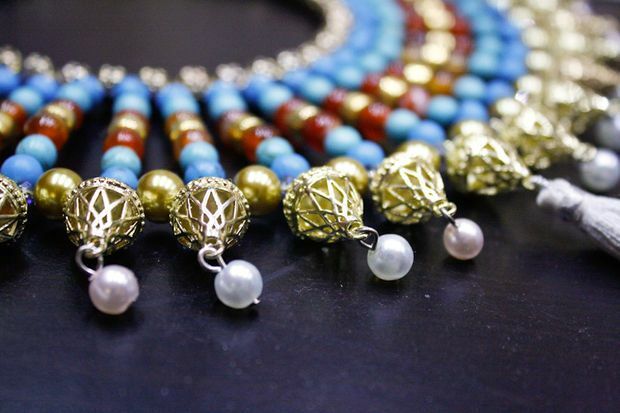 The hand selected mix of beads and findings all fit together perfectly with gorgeous colors and unique shapes that are sure to inspire. 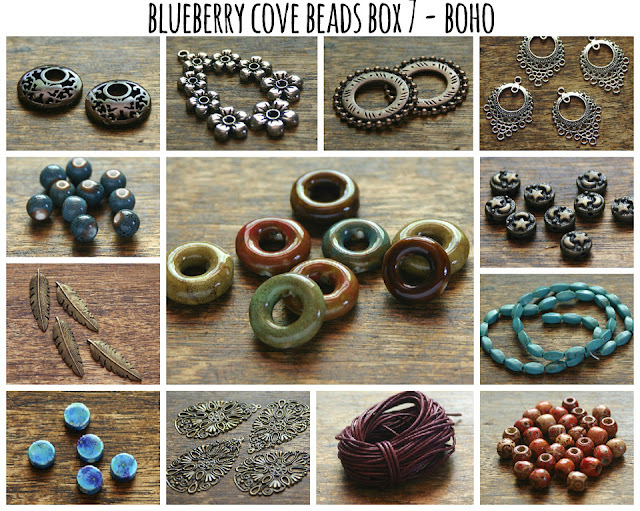 Blueberry Cove Bead boxes are available as a monthly subscription for yourself or as a gift. This holiday season, single boxes are also available to order as gifts or to treat yourself to something fun! 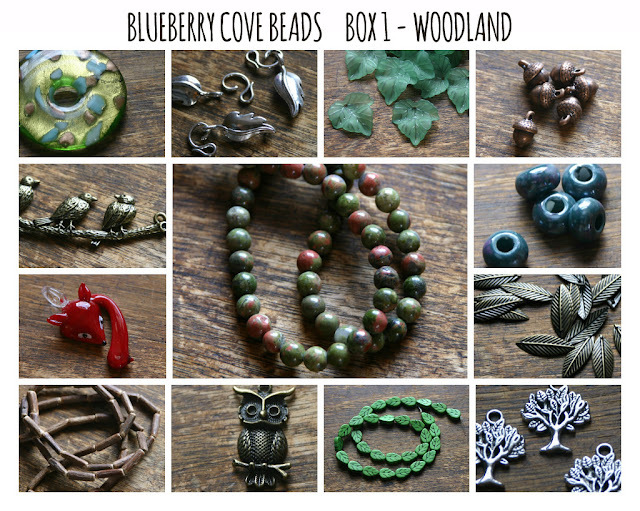 For a chance to win a November bead box with an all-new theme, visit Blueberry Cove Beads and check out the previous collections. Leave a comment here and let us know which one was your favorite! One winner will be drawn on Sunday, November 1st. This giveaway is open to readers from Canada and the US. Please be sure to comment on InspirationalBeading.Blogspot.com, and include an email address in your comment so that I can contact you if you win! If unclaimed, the giveaway will be redrawn on Wednesday, November 4th. This week I’m working on a new fringe necklace, and I cannot wait to see how it will come out. I wanted to try the new shell pendants in my surprise pack from Blueberry Cove Beads; the shape and color is gorgeous, and the pendants are just the right size for really bold fringe. I pondered a few different palettes, but decided to go with a strong contrast in blue for the rope base. As I was looking over my blue seed bead stash, I realized that I had several different shades of blue in opaque rainbow finish, so I thought it would be fun to combine them in an ombré type pattern. All I have to do now is decide on a color for the fringe strands! The pendant that I was working on last week turned out kind of amazing. I love how the three chain colors work together, and how they highlight the finish of the ceramic focal. Unfortunately, I was so engrossed in what I was watching as I finished the necklace that I forgot to cap the strands with the second druk. (Thanks a lot, Cracked.com!) I think perhaps I’d better stick to watching movies I’ve already seen while working, just to be safe. On the plus side, I was planning on keeping this piece for myself, so I’m not too worried about it. Nobody’s going to see the missing druk while I wear it! Swarovski Elements recently released a new coating for crystals and crystal pearls they call Scarabaeus. The finish is a beautiful iridescent blue-green-purple which is very much like the opalescent shell of a fantastic beetle. I can’t remember the last time I was so excited about a new Swarovski innovation – I’m very much looking forward to seeing these new jewels in person. Although the finish is a bit on the lighter side, I think I can come up with some Nefertiti-worthy ways to use a few key pieces. 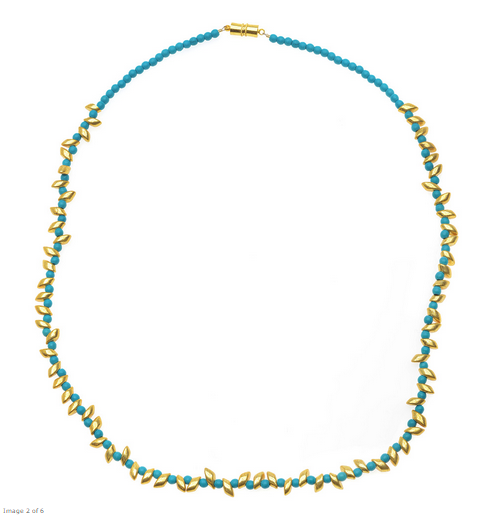 perfectly captures the look of real Egyptian strung necklaces. Which Egyptian color or motif do you find the most inspiring? This week I’m wrapping up a couple of pendant projects, including a new multistrand piece featuring a ceramic focal from the Blueberry Cove Beads Autumn collection. 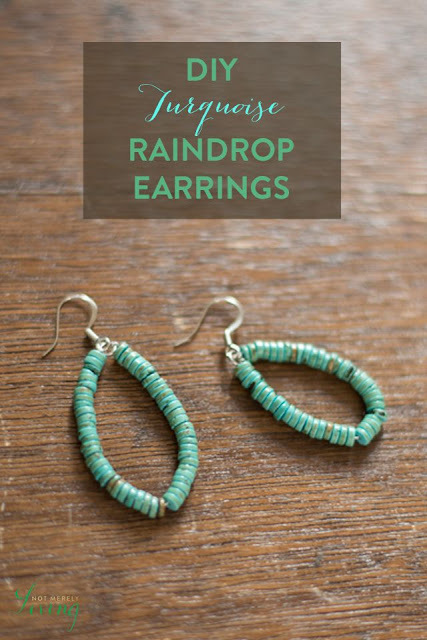 I love the earthy finish on the beads, and I wanted to dress it up with some similar hues and a splash of color. I couldn’t resist pairing up Autumn Tucson gold with cobalt blue. I think a little brown iris for the third strand will work nicely, and then I’m in the mood for a new herringbone fringe piece. The shell pendant project turned out pretty well, though the glass daggers don't have quite the same impact as the baroque pearls I used in previous variations. We haven’t yet finished our new embroidery pendant. Most of my beading gets done late at night, and I’m sorry to say that I keep forgetting to ask for the final two color choices on this one. I’m looking forward to an actual two-day weekend coming up, so hopefully I’ll be able to get some daytime beading in a finally finish this one. 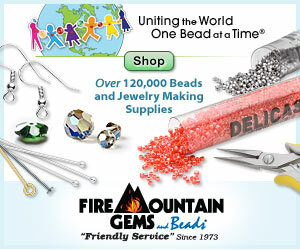 New inspirations are a constant quest for beaders, and one of the best ways to find them is to try out new materials. But whether we shop in a store or online, the choices can often be overwhelming. It can be difficult not only to choose a few new beads from the thousands available, but also to coordinate our choices in a way that will make a great piece of jewelry. At Blueberry Cove Beads, a lot of the guesswork in finding new beads to try is done for you, and comes with the added bonus of a delightful surprise. 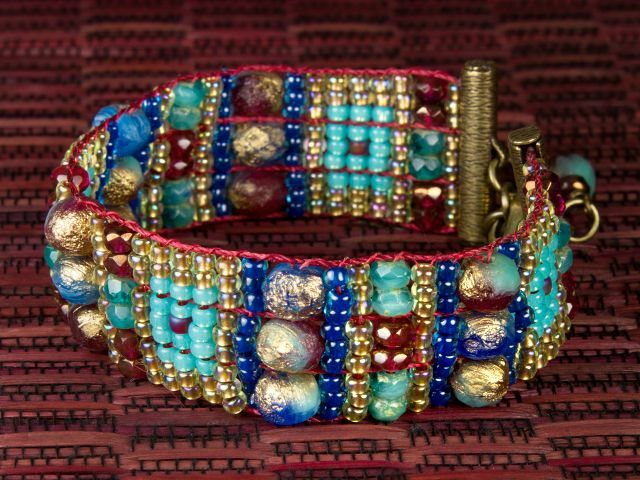 This new bead subscription service offers hungry beaders with gorgeous ensembles that are perfectly coordinated, in quantities that allow you to make multiple pieces with a variety of techniques. When you subscribe, a box of gorgeous beads will be sent to you each month, featuring a fun theme with materials that are easy to mix and match. Subscriptions are available in 3, 6, in 12 month packs. You can also purchase single boxes from past months, or a mini box featuring a few essentials from each theme. Each month’s box is reasonably priced, and you get a lot of beads to mix with your stash. Pictured here is just a small sampling of the pieces from the September 2015 pack “Autumn”. The combinations of orange, yellow, dark red, brown, and copper are totally mouthwatering. When I opened my packaged I wanted to drop everything and start creating! There are several types and sizes of beads included, as well as findings that perfectly evoke the month’s theme. My favorites from this pack are the orange shell pendants and the amazing strand of orange glass beads. The full contents of each month’s bead box aren’t revealed until after they’ve shipped out to subscribers, so you’ll get a wonderful surprise whenever your package arrives. Your beads come in a pretty drawstring bag, ready to use however you like. You’ll also get a pretty postcard to match the theme, which also contains a beading challenge. 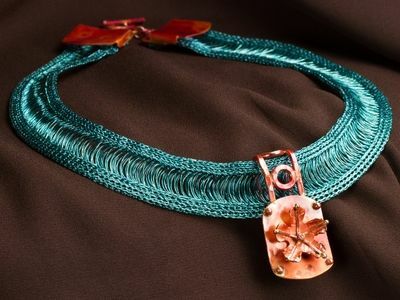 If you make something with your beads that fits the challenge, you can enter it in a draw to win your next month free! Want to give it a try? 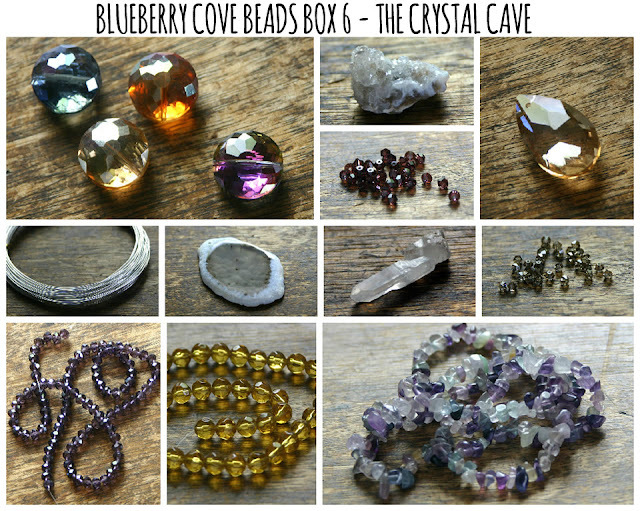 Purchase a box or subscription from Blueberry Cove Beads by November 3rd to get the next available pack. When you subscribe, payment for each new themed bead box is deducted on the 3rd of each month, so you’ll never miss a batch of inspiration! I would like to thank Blueberry Cove beads for allowing me to sample one of their amazing bead boxes. Inspirational Beading has not received compensation for including products in this post. Subscriptions are currently available for Canada and US residents. Greetings to my fellow beaders after a much too long absence! My work schedule has been scrambled around quite a bit these past few weeks, and it’s has totally derailed all of my other schedules like sleeping, beading, and writing. I’m going to have to work out a new way of planning out my free time, but for now I’ll just have to play a little catch-up. Although I didn’t have time to write anything special to celebrate the official release of Ancient Worlds Modern Beads today, I have been able to do a smidge of beading here and there. I’m almost finished a new spiral rope pendant featuring one of the carved bone shells that I added to my stash a while back. Originally, I was just going to go with a plain rope, but I found that the combination of colors made the rope look too naked, so I added some fringe beads and magatamas to bulk it up a bit. All that’s left is to construct the various components and then I can move on to something new!